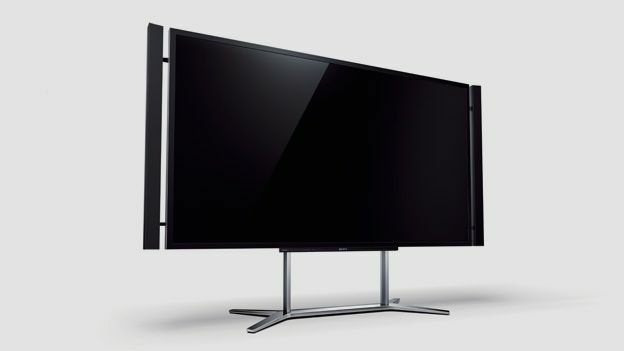 The Sony KD-84X9005 4K TV offer four times the picture resolution of current HD screens. Sony has thrown down the gauntlet to rivals and content providers alike with the launch of its first 4K resolution TV. The 84-inch Sony KD-84X9005 is no wall flower, being both expansive and expensive in equal measure. With a UK street price of £25,000 small wonder distribution is initially being restricted to high-end high-street emporium Harrods. We first caught sight of this gigantic gogglebox at IFA, and were suitably awe-struck. Now we've had the set in for a more in-depth analysis, and can confirm the finished version is as good as first hoped - but there are caveats. The only current 4K competition comes in the shape of the Toshiba 55ZL2, although there are regular Full HD super-sized screens available from Sharp, Samsung and Panasonic. Resolution aside, this TV mirrors the feature set of Sony's HX8 fleet (including the Sony 55HX853) . It's net-connected, offering access to the usual broad selection of streaming TV services, including catch-up and movie rentals. This is also the first Sony LED to be released (outside of China) to support Passive 3D. This 4K debutant may cost a packet, but there's been no scrimping on build quality. It's a beautifully finished panel. The most notable elements of the design are the detachable stereo speakers, which can be angled or removed completely. Connectivity comprises four HDMI inputs, Scart, component, phono stereo, PC, two USB inputs and Ethernet. Wi-Fi is built-in, supported by Wi-Fi Direct for local connections. Only two of the HDMI are 4K enabled. OK, here's the headline: Sony's first 4K TV offers the best image ever seen on a consumer set. It is, at its best, simply astonishing. Shout it loud and shout it clear. But there's plenty of devil (literally) in the detail. With native 4K (3840 x 2160 resolution), the screen sparkles like the Hope diamond, but with some content it looks no different to a vanilla-flavoured HD TV. For this audition, we accessed its 4K performance using specially prepared content played out from a PC; naturally image density and fine detail are astounding. Of course, buyers will be limited to 2K source material, and here performance is much more unpredictable. Thanks to the new three-chip 4K X-Reality PRO combo, newly minted Blu-ray movies can look luscious. The set's processor is able to exploit untapped high frequency information in the source material, producing an image akin to quad HD. However, content without latent high frequency cues looks much the same as regular Full HD, just scaled to fit the panel. That said, this 4K screen delivers the best 3D we've seen outside of a commercial theatre. When it comes to traditional picture attributes the screen scores reasonably well. Black levels are deep, but betray some uniformity problems with edge-lighting. Motion resolution powered by the XR 800 Hz Motionflow processor, on the other hand, is splendid. One area which does disappoint though is the GUI. Sony should have implemented a 4K user interface, but instead has shoe-horned in an off-the- shelf user interface that doesn't scale particularly well. The TV's audio performance deserves trumpeting. Those high performance stereo speakers, which pack 10 drivers and 50w of amplification, deliver theatrical-grade cinematics. Sony has set the bar supremely high with this first 4K 84-incher. The size suits the tech well and hints at a future of super-resolution viewing. Admittedly, there's no 4K content around just yet, but up-rezzed Blu-ray looks nearly as good and a 4K upgrade to the PS3's PlayMemories Studio package is on the cards; JPEGs at 4K resolution are gorgeous at this screen size. Pro photographers will love what this set can do. Obviously, the set's price tag will preclude ordinary mortals joining the picture party, but the Sony KD-84X9005 will doubtless find eager buyers amongst oligarchs and celebrities. The rest of us just need to bide our time, and wait patiently for all those extra pixels to trickle down.